To liveaboard at anchor you never tire of the endlessly changing sea, sky, and landscapes you encounter, the spectacular and spiritually uplifting display that never repeats itself and always has something to offer. This is especially true when you are on the move between bays and islands. You develop an increasingly greater appreciation of freedom, and independence from shore side entanglements. 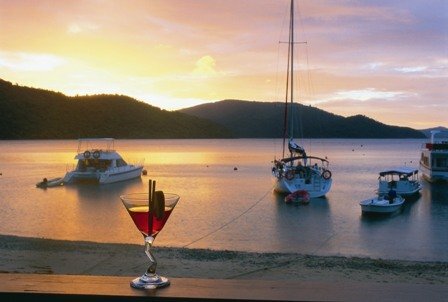 But some things you enjoy on shore need a bit of thought and planning to enjoy them while sailing or at anchor! How to live comfortably with adequate power! How to take care of fresh water issues! Without a doubt, the hot shower is the hardest thing to give up, and on medium sized boats showers can be a major challenge. And there are lights and freezers that need power other home comforts too, like the stereo, TV, and computers. Most yachts in our modern age have taken care of most to all of these challenges. When I was at anchor I routinely ran the engine for at least an hour a day to keep the batteries charged. You need the ability to start the engine after sitting around at anchor for 3 or 4 days using battery power. But now with wind generators and good compact quite petrol operated genny’s we can have plenty of power for all house hold needs, TV,s computers and the like. And have our batteries powered as well. 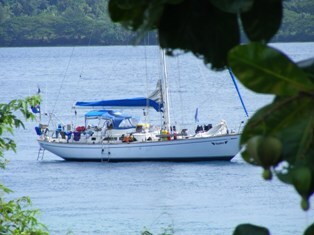 One liveaboard sailor commented on his experience, “That being said, I far prefer to be anchor. A proper cruising boat doesn't need to be connected to the land by an umbilical cord. I go to the dock once or twice a month to fill up with diesel and water then head back out onto the hook. I run the engine twice a day to chill down the fridge and freezer (I have engine driven refrigeration as well as 12V), heat the water for showers and dishes, charge batteries (although I have a wind generator and solar panels I get TV and radio on the hook. Then of course as mentioned there’s the marine generators which are smaller and quieter for boats of all sizes that supply electrical power not straining the boat batteries, this is one of the best choices. They can run fridges, air conditioning, and other appliances. Other uses of marine generators include powering radar and other boat instruments, small appliances like stereos and radios, TV and lighting equipment. A marine generator can come in handy during fierce storms where electrical power can provide some needed functions for safety. A marine generator has many similarities to other types of generators. It is designed to run on fuel types like diesel generators, gasoline and propane and run a number of applications depending on the wattage rating. Marine generators should be sized according to the number of appliances, other accessories that will be used and are designed to handle use on water. So no need to go without adequate power for all your needs there are a number of solutions! Enjoy all the comforts of a land based home on the water … OK but now it’s mentioned what about fresh water for drinking and showers? When you liveaboard at anchor whats the best way to have fresh water on board? And if you want to make money while living at anchor .... see the link below! !